We love passing on tips of things you can do at home to help yourself, particularly using things you already have close at hand. With the temperatures already starting to drop – and farmers busy in the fields – this week we’d like to highlight the medicine chest lurking in your kitchen ready for the season ahead. The many health properties of garlic are well known. Not only is it antiviral, antibacterial and antifungal; it’s also a powerful antioxidant and helps boost the Immune System. Even better, it also contains a huge range of nutrients including Vitamins B1, B6 and C as well as manganese, selenium, calcium, copper, potassium, phosphorus and iron. Research has repeatedly confirmed the traditional view that garlic reduces the likelihood and severity of winter bugs, particularly Colds and Flu. However, it doesn’t stop there. It’s also been found to lower blood pressure and cholesterol, treat fungal infections and aid the detoxification process. The simplest – and least anti social (!) – way of taking garlic is as a capsule. It can also be added to food as a flavouring, although it loses some of its potency when cooked. 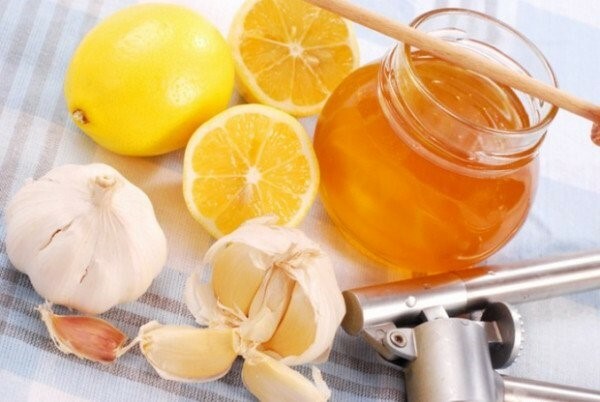 One of our favourite naturopathic remedies for Colds and Flu is to mix several cloves of crushed garlic into a jar of local honey and then take by the teaspoon two or three times a day. Not only does it help send bugs on their way, but it keeps everyone else at bay too (!) reducing the chances of you passing it on – or picking up another bug from someone else while your defences are low. We’ve waxed lyrical – excuse the pun (!) – on the many benefits of honey before in this blog. Like garlic, it has been the subject of much research which has confirmed its many traditional uses. Honey has well known anti inflammatory, antimicrobial, antiviral and antibacterial effects as well as being a powerful antioxidant and Immune System booster. Its impressive range of nutrients include Vitamins A, B, C, D, E and K as well as magnesium, sulphur, phosphorus, iron, calcium, chlorine, potassium, iodine, sodium, copper and manganese. And don’t forget about the high levels of live enzymes and other substances it contains, with propolis being the best known. It can be used to help soothe coughs, as well as for colds and flu generally. Interestingly, this has finally been recognised by the Department of Health, which has proposed new guidelines this Autumn recommending the use of honey as a first line treatment for Coughs. Honey has long been used to dress wounds, burns and ulcers; with research repeatedly showing complete recovery without any infections, muscle loss or need for skin grafts. And this applies to honey generally, not just Manuka honey. As we’ve just mentioned, honey can be used to help soothe a sore throat. Simply take a teaspoon full as needed. It works brilliantly with garlic and also thyme to help clear mucus and catarrh – or can be used together. Alternatively, it can be used with lemon and ginger to make a comforting drink. More about lemon and ginger in a moment. Finally, a teaspoon of honey dissolved in warm milk is another traditional way to promote a good night’s sleep. Ginger has been used both in cooking and medicinally in the Far East for centuries. It contains gingerol, a well known anti inflammatory and powerful antioxidant, as well as many nutrients. These include Vitamins B6 and C as well as potassium, copper, manganese, magnesium, phosphorus, iron, zinc and calcium. It’s also a well known as a diaphoretic, which means that it helps to warm the body from within by promoting sweating. Not surprisingly, this makes it very useful in the treatment of Colds and Flu, as sweating is a powerful part of the immune response. A raised temperature not only increases the efficiency of the Immune System overall but, just as important, makes the body less hospitable to winter bugs so preventing their spread as well as encouraging them on their way. While it may sound contradictory, ginger has a calming effect too, hence it being a traditional cure for indigestion, nausea and travel sickness. It can also help reduce inflammation and so assist in pain relief. A slice of fresh ginger steeped in hot water makes a comforting drink to help speed winter bugs on their way. Honey can be added to make it more palatable and for its healing qualities. It works just as well for digestive issues, whether as a hot drink or simply sucking a small piece to help relieve indigestion. Like all fresh fruit and vegetables, lemons contain high levels of antioxidants and Vitamin C, hence their important in a healthy diet. They also provide calcium, magnesium, potassium and iron. While the antioxidants and Vitamin C are important, lemons also help to clear catarrh and mucus, making them useful in treating winter bugs. They have also been found to help lower risk of strokes and high blood pressure, along with increasing the absorption of iron and improving acne. Lemon works best in combination with honey and / or ginger as a soothing hot drink. It can also be added to cold water to make it more refreshing. Pineapples have to be one of our favourite fruits. Not only do they contain high levels of antioxidants and Vitamin C but Vitamins A, B1 and B6 along with manganese, copper, magnesium and potassium. However, just as important, they contain an enzyme, bromelain, which helps to clear mucus and catarrh. With all these qualities, it’s not surprising that pineapple is a great way to help soothe a sore throat, clear catarrh and boost the Immune System. It can be eaten fresh or as juice, best diluted 50 / 50 with hot water as a soothing drink. Another tip is to freeze the juice into cubes, which can then be sucked to soothe a sore throat. As a quick aside, don’t forget that the highest quantities of Vitamin C and bromelain are found in the tougher core. So, if you’re eating it fresh, remember to include the core and chew on it. And if you’re juicing it, include the core as well. Shop bought juice usually contains the core but, as with all pre prepared fruit and veg, nutrients are lost as soon as the skin is cut. So, it’s always much better to buy the whole fruit and then cut it up – or juice it – at home. Last, but not least, there’s something else lurking in your kitchen which also helps to speed winter bugs on their way. It’s one we can guarantee that you won’t have thought of and you’ll probably groan when we mention. What is it? Yes, we know it’s boring – and one of our pet subjects (!) –but please bear with us a moment. If you stop and think about it, our bodies are over 70% water and it’s vital for all those body processes we take for granted. The Immune System is a good example of this, with huge amounts of water being burnt up by the immune response. This includes raising the body temperature to maximise its efficiency, which also makes the body less hospitable to invaders. And that’s without producing all the snot, catarrh and mucus which, after all, are water in various different forms (!). Yes, we can feel you squirming at the thought but it’s true… Given all of this, it’s little wonder that Colds and Flu make us feel so dry and thirsty. So yet another reason to drink plenty of water – or diluted squash or pineapple juice if you prefer. Not only will you feel better for it but it will help to speed things on their way.